A fairly lacklustre open to the trade this morning with the market trying to take the high road before succumbing to selling, mainly focussed in the banks following last week’s strong run up. That said, buyers bought the weakness from around lunchtime onwards and the market recovered into the close. 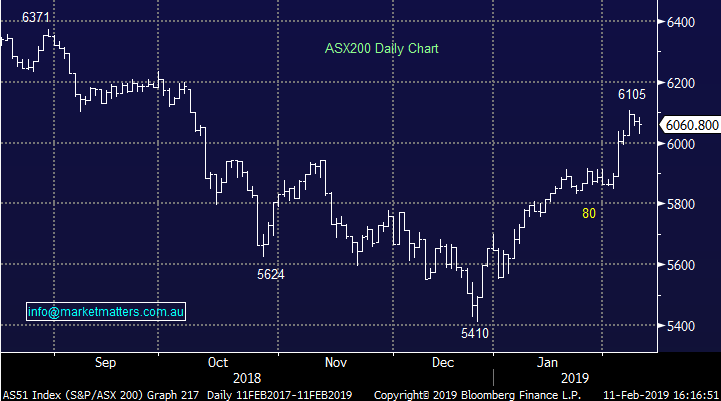 At its worst the ASX 200 was down ~40points but closed down just 10 as we saw some decent volume start to flow back into the big 4. On the reporting front, Bendigo released a weak set of numbers, with revenue down and costs meaningfully higher – really soft underbelly there, while JB Hi-Fi (ASX:JBH) was reasonable (given the tough retail environment). 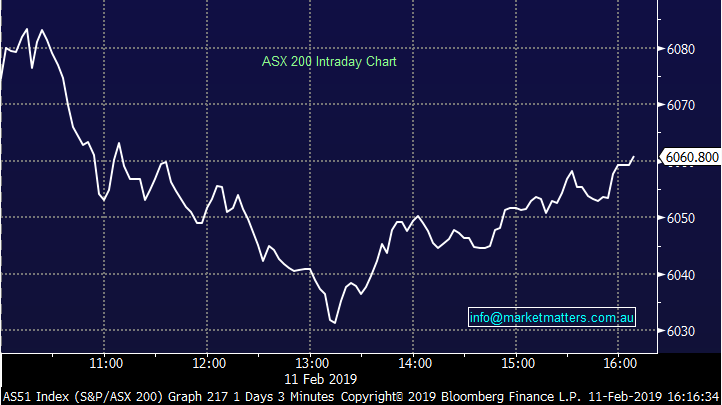 Overall, the ASX 200 closed down -10points or -0.18% to 6060. Dow Futures are currently trading down -28pts. Reporting; BEN and JBH in focus today and Harry has covered them off below – we have no interest in either name at this stage. 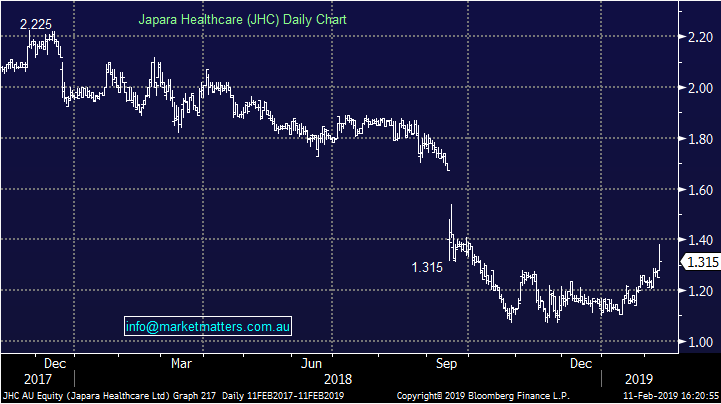 Amcor (ASX:AMC) was decent and worth more of a look – they beat strongly on the profit line and the stock rallied as a result. In the property space, GPT delivered full year results which were in line with expectations – Funds from Operations were +3.7% on pcp to $574.6m while FY19 guidance is FFO/share growth of +4% (implying ~33.1¢¢) and DPS growth of 4% (implying 26.5¢). The stock up smalls as a consequence. 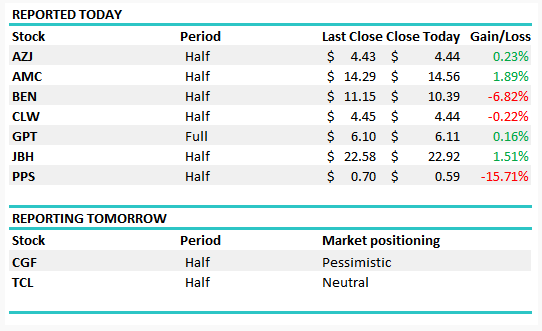 A quieter day tomorrow however in addition to below we also have Macquarie (ASX:MQG) out with an operational briefing…Mkt is now looking for full year profit growth of ~18% which is a big number after a volatile December quarter! 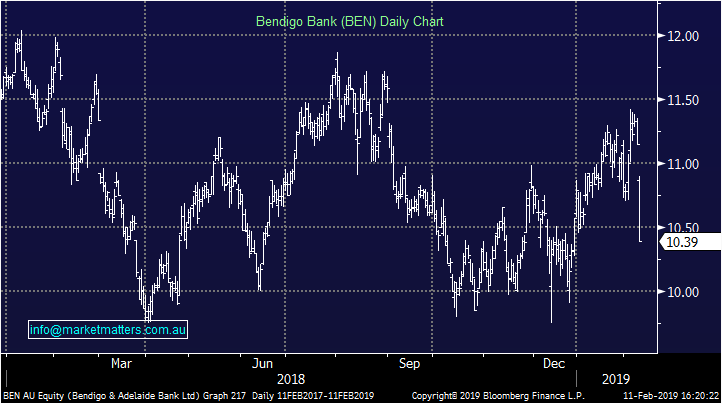 Bendigo (ASX: BEN) -6.82%; The regional bank has slumped today, taking other financial stocks with it on a soft first half result. Bendigo has missed on expectations, as costs rise and income falls – BEN missing expectations by ~2% at the profit line. Bendigo was hoping to see loan growth in the face of the Royal Commission but in the end saw the loan book shrink over the half and revenues fall by around 1%. Mortgages might have grown, but a measly 2.7% growth there was more than offset by the slump in commercial lending. Net Interest Margin (NIM), the difference between what the bank pays for funding vs the rate it loans out to you and I, fell 3bps between the 2nd half of 2018 and this 1H19 – not a trend you see often with a shrinking loan book. To add to the woes of the result, costs continue to skyrocket, up 8% from the 6 months prior as the bank struggles to grow. The only positive of the update was a continued slide in bad debts, yet this wasn’t enough to cover the impact of rising costs on falling revenue. We prefer the major banks here over the regionals. 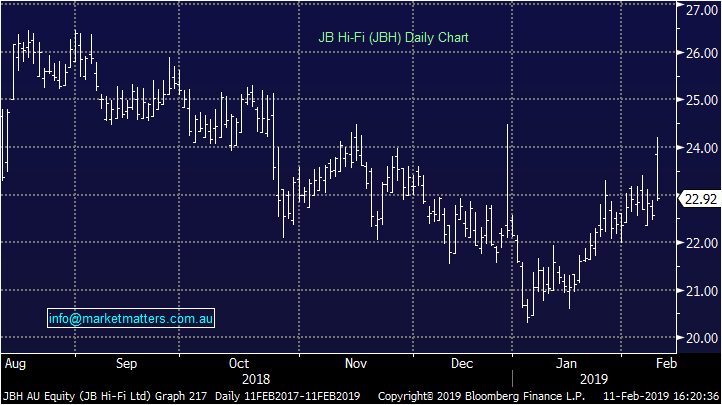 JB Hi Fi (ASX: JBH) +1.51%; the first of the big retail names to report and the one with the biggest short interest (~16%), JB Hi Fi’s result was better than expected, and even the outlook was not the car crash that the market had feared. The big surprise in the result was the performance of the Good Guys, the business that has been a big drag on JBH results for the past few years. The GG’s printed sales growth of 1.5% while margins actually expanded, although off a low base. The NZ operations also saw some improvement, although JBH NZ is a small portion of the group’s profit. Outlook was mixed, however few in the market are positive Australian retail, so it looks a better than expected outlook. January has seen some slowing sales yet guidance for the full year was at worst in line with expectations. JB is looking at full year profit of $237-$245m vs consensus of $239.6M at the lower end. Overall, the group profit rose over 5% on the first half of FY18, the dividend grew 6%, guidance was slightly better and the stock has rallied over 1.5% today as a result.